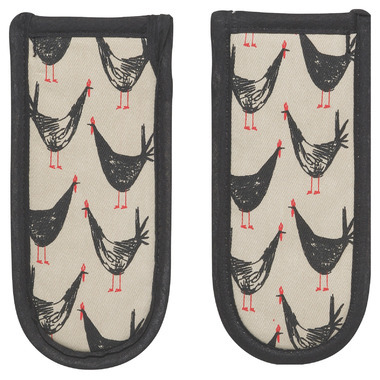 Protect your hands from hot pans and skillets with these trusty handle holders, quilted for comfort and ease. These curious owls are here to help and offer friendly conversation. 100% cotton. W3 x L6.5 inch. I don't know why a previous reviewer said hers caught fire - unless she has gas flames or uses them on the barbecue. Mine stay on my cast iron skillets all the time and are they ever handy! I had a larger pair once that were too long but these ones are a much better fit and they have never caught fire on my electric stove! These are a must have for me. BRILLIANT idea! Why have I not seen anything like this before??? I'm buying more! Just don't leave hem on your pot when you cook... They WILL catch fire! Oops.